Soon after getting the Blade 400 I realized I will need a radio in order to fly it. I know that the guy who I traded the b400 for said he will give me his DX6i, but I do not know how long it is going to take him to send it to me, if he even sends it at all. 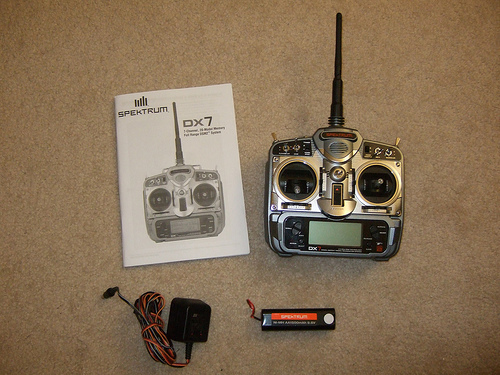 Once again it gave me a good excuse to buy the Spektrum DX7 that I always wanted. However, I did not want to spend $350 for a brand new one that had servos and a RX that I will never use (unless I get in to airplanes). At first I tried bidding on a brand new one without servos and RX on ebay, but they always end so high. And one day I was able to catch another good deal on rcuniverse.com; a used DX7 (heli version, Mode 2) with battery, charger, and manual for only $150 shipped. When it arrived in the mail (I received it in 3 days) I was very happy with its condition, and it is exactly how the guy described. For some reason I though the DX7 was a better radio, do get me wrong this radio works great. The only major gripe I have about this radio is the menu interface, lack of a scroll bar, and back-lit screen. Other than that this radio does everything I need it to do and more.